Here at the Plate Rack Co we produce quality hand made bespoke kitchens. Made up from free standing units, put together they combine to create a truly individual bespoke look. All of our units are made from real timber and hand painted. They are hand crafted using traditional carpentry techniques, mortised and tenon doors and dovetailed soft close drawers as standard. Any combination of units from oven housing, islands and drawer pieces can be put together to suit you and your kitchen. Shown below is a small selection of our work. 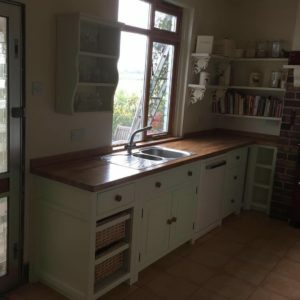 If you would like to know more on how we can create your dream kitchen then feel free to contact us by phone on 01386 438348 or by using our online contact page at the top menu. We look forward to hearing from you soon.